As evidenced in these mid-last-century magazine advertisements, Sylvania Electric marketing moguls learned early what sells products by exploiting the nature of their audience. 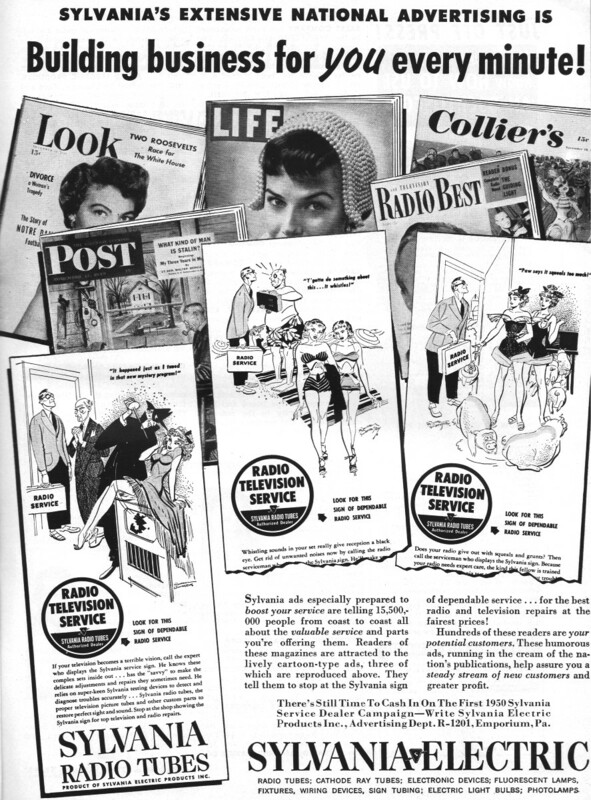 The cartoon-style ads shown here appeared in social publications like Look, Life, and Collier's, where both men and women - many of them numbnuts - are the expected audience. Compare these with the type of ad run by Sylvania in a 'serious' magazine like Radio-Craft. Building Business for You Every Minute! Sylvania ads especially prepared to boost your service are telling 15,500,000 people from coast to coast all about the valuable service and parts you're offering them. 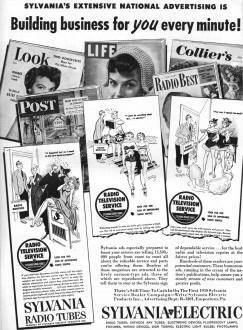 Readers of these magazines are attracted to the lively cartoon-type ads, three of which are reproduced above. 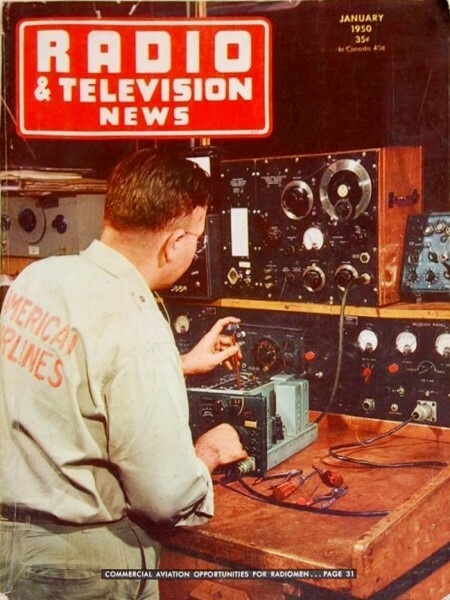 They tell them to stop at the Sylvania sign of dependable service ... for the best radio and television repairs at the fairest prices! Hundreds of these readers are your potential customers. These humorous ads, running in the cream of the nation's publications, help assure you a steady stream of new customers and greater profit. There's Still Time To Cash In On The First 1950 Sylvania Service Dealer Campaign - Write Sylvania Electric Products Inc., Advertising Dept. R-1201, Emporium , Pa.